Ramnaresh Sarwan is a product of the Malteenoes Cricket Academy. When Fitness 53 contributed funding to the Malteenoes Cricket Academy it was just an appreciation gift from its CEO Ramnaresh ‘Ronnie’ Sarwan who was among the eager youngsters at their inaugural Academy in 1993. On Tuesday last, Supervisor of Fitness 53 Kavita Goberdhan presented the sponsorship cheque to PRO of Malteenoes Sports Club Sean Devers to demonstrate that Fitness 53, located in Providence East Bank Demerara, is a good Corporate Citizen. The two-week Academy starts at 09:00hrs on July 23 at the club’s Thomas Lands Venue. Registration is fee $3,000 and can be picked up at Malteenoes and Lunch will be provided each day which ends at 15:00hrs. Registration closes on July 20 and more information can be had by calling Malteenoes on 225-6509. The 38-old Sarwan has 15 tons and 31 fifties from 87 Tests at an Average of 40.1. He has played 181 ODIs, 18 T20 Internationals and scored 33 tons from 220 First-Class matches. Sarwan said that the Academy taught him not only the skills to kick start his cricket career but also lots of life skills which has made him a well-rounded person, which has served him well, much later in his life when he captained Guyana and the West Indies in all three formats. 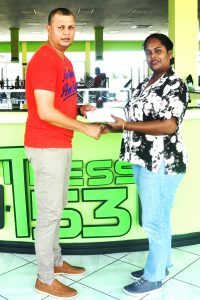 Supervisor of Fitness 53 Kavita Goberdhan presents the donation to PRO of Malteenoes Sean Devers at the Gym at Providence. Sarwan left Wakenaam and moved to Campbellville where he attended Primary School and then the Malteenoes Cricket Academy and encouraged youngsters to register quickly and make use of an opportunity which he said could be the first preparation for a successful career in cricket. 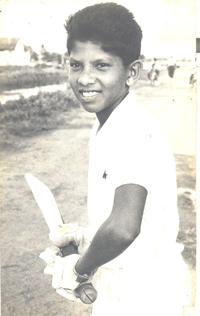 Sarwan’ 291 against England is the highest Test score by a Guyanese; he is youngest Guyanese to play First-Cricket at 15 and he is the youngest West Indian to reach 5,000 Test runs. Sarwan is one of two Test players produced by the Academy; the other being Ryan Ramdass. Sarwan said it felt good to contribute to the development of youngsters in the formative years of them learning about cricket. Sarwan is presently in Canada and wished Malteenoes well as the club provides a nursery for children who could one day be the next Sarwan, Chanderpaul or Hooper, the last three outstanding Guyana’s Test batsmen.